When it comes to defeating the odds, BATTLE BEAST pulled off something approaching a miracle with their last album, 2017's "Bringer Of Pain". The departure of founding member, guitarist and chief songwriter Anton Kabanen (now of BEAST IN BLACK), whose vision had driven the band's entire catalogue, could easily have derailed the whole enterprise; or, at the very least, robbed the band of the considerable momentum they had built up over the preceding years. Instead, "Bringer Of Pain" was a complete revelation: a non-stop barrage of instantly memorable anthems. The album undoubtedly took the Finns further into AOR territory, but with such uplifting intensity that resistance was futile. Having found themselves in need of some material that wasn't penned by their estranged former colleague, BATTLE BEAST suddenly found themselves with a set full of nailed-on crowd-pleasers. Repeating that trick will not have been an easy task, but "No More Hollywood Endings" comes pretty close to emulating the previous album's ludicrous strike rate. The opening triumvirate of "Unbroken", the title track and "Eden" amounts to a bewildering assault of gleaming, radio-friendly hooks and infectious, '80s-metal grooves. Although occasionally hovering somewhere near the thin line between tribute and plagiarism—"The Hero" briefly sounds uncannily like Irene Cara's "Fame" re-imagined for the synthwave generation—the rapid, insidious power of the choruses in each and every song here is undeniable. Just consider how utterly enormous BATTLE BEAST could have been, had they released something as breezily immaculate as "Endless Summer" back in the '80s? 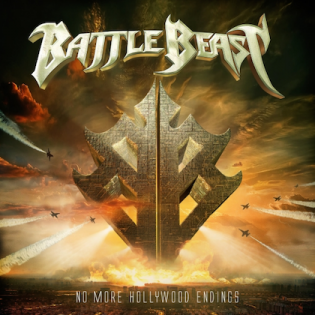 That's not to say that "No More Hollywood Endings" is wholly rooted in the past: BATTLE BEAST's power metal roots are present and pervasive, most notably on the thunderous, DORO-esque "Piece of Me" and the tooth-rattling speed-fest of "The Golden Horde". The album's pristine crunch also points to a happy balance between old-school songwriting and 21st century oomph. Ultimately, no review of a BATTLE BEAST record is complete without acknowledging the principal ingredient that has propelled this band from aspiring early days to their current status as one of the melodic metal world's most effervescent forces. In an age when metal's new generation are failing spectacularly to produce any truly great singers, Noora Louhimo is a towering beacon of vocal brilliance. With all the power and presence of the greats and a range that verges on eye-watering, she is the band's beating heart and their most ferocious weapon. She has never sounded more commanding or versatile than she does on "No More Hollywood Endings", and the star quality she brings to more melodramatic moments like the orchestral rush of "I Wish" could yet take this band to great heights. Time will tell if these songs will have the same immediate impact that made "Bringer of Pain" such an unexpected step up for BATTLE BEAST. Either way, "No More Hollywood Endings" is a giant, jolting dose of feelgood heavy metal, played and sung with great exuberance and custom designed to make us all feel a little less despondent about this stupid world. And my god, that voice!